The first I knew of my profile page was when I found it ranking in the serps. I have to admit to being a little surprised. I would have thought that Amazon would have alerted me to the fact that I had my own public page. After all, people love having their own pages which they can edit! While the page doesn't contain any directly personally identifiable information it does show my full name. The news here is that wish lists are automatically viewable by everyone and anyone. I would imagine you could easily have sensitive items on your wish list which you didn't want to be viewed by anyone. You also get to customise which parts of your profile are viewable externally - such as recent purchases (which I have enabled on my profile). Unfortunately, you can't shuffle the layout like you can in facebook which means that most of the content on my page is all down the right hand side without much content in the middle. 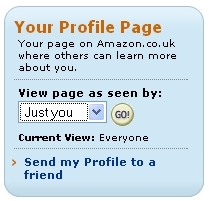 ##Does everyone get an Amazon profile page? No. As far as I can see you only get one if you have ever left a review of a product or if you have ever created a list for listmania. Amazon gives a bit of info on this page. However, even if you don't have a profile you can still search for people's wishlists. For example - I found Will's wish list which is viewable by anyone.